Stone mill is commonly known as Raymond mill and Raymond mill. It is mainly suitable for processing materials in non-flammable and explosive minerals, chemicals, construction and other industries, with Mohs hardness below 7 and humidity below 6% such as barite, limestone, marble, dolomite, activated carbon and kaolin. More than 300 kinds of materials, the finished product size can be arbitrarily adjusted within the range of 80 to 325 mesh. 1. The grinding machine should have a fixed staff member in charge during the use process, and the personnel should understand the principle performance of the machine, be familiar with the operating procedures, and must have a certain level of technology. 2. After using the machine for a period of time, it is necessary to carry out maintenance. During the period, the wearing parts such as the grinding ring and the blade should be repaired or replaced in time. Before and after the use of the grinding roller, the connected bolts and nuts should be inspected to see if there is looseness. Phenomenon, whether the lubricant is added. 4. 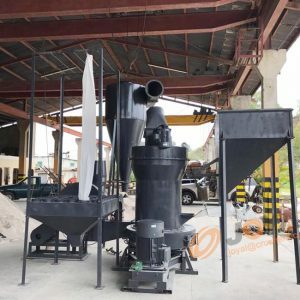 In order to make the stone mill work normally, it is necessary to formulate relevant safety operation system, and at the same time, it is necessary to equip the maintenance tool and the corresponding accessories of the grease. The above is the precautions for the use of the stone mill. Shanghai Joyal provides the overall design and construction plan for the grinding operation. In order to meet the requirements of different rock, fineness, output, use and different process requirements, the company optimizes the investment scale according to local conditions and optimizes the investment scale. Benefits are for the purpose. If you need equipment, please feel free to contact us or visit our company. Previous: Micro-powder grinding machine grinding ore analysisNext: Why does the particle size of the ultra-fine mill become thicker?